I stand, legs wide in a sturdy stance, watching the far bank approach. The creak of the hand-cranked wheel and the intermittent buzz of insects in the air are the only sounds I can hear until finally the ferry pilot speaks. “Once we reach the shore, just follow the road. It is about one mile up, and then you will reach the entrance,” he says. 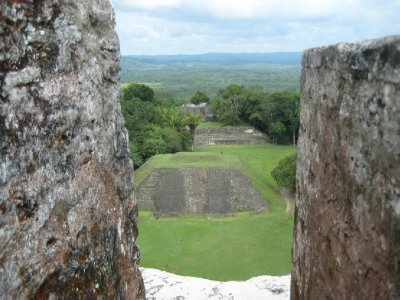 The entrance to the stone lady - Xunantunich. 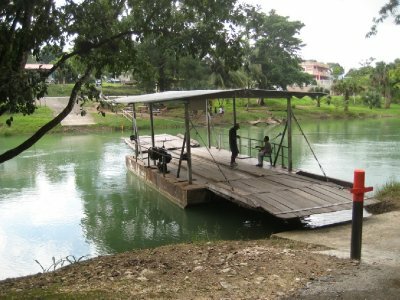 The hand-cranked ferry reaches the far shore of the Mopan River, just off the Benque Road. I step off, wipe my brow and reposition my hat against the late morning sun. 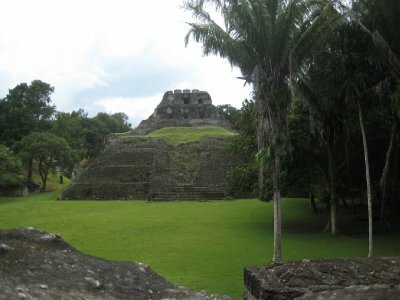 I set off up the road, one mile away from the Mayan ruins of Xunantunich. 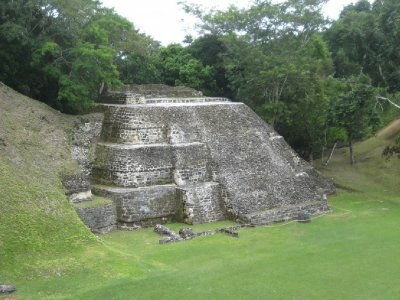 The Mayan civilisation flourished in Central America, most especially in the Yucatán Peninsula, until 900 A.D. During the period from 250 A.D. until 900 A.D., some of the most impressive Mayan cities and temple sites were built, including the Mayan sites I have seen previously at Chechen Itza and Tulum in Mexico. 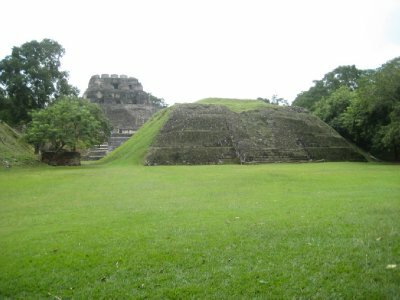 Xunantunich, in the interior of Belize, sits just a few miles from the Guatemala border. 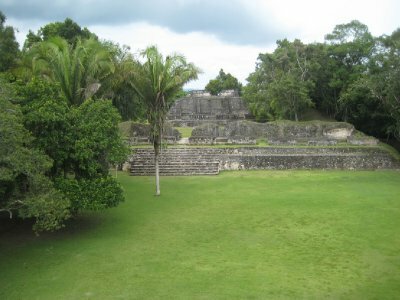 The site covers approximately a square mile, with the centre of the site consisting of a plaza with three structures in a row. 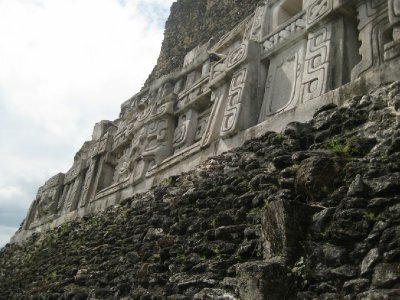 The main building on the site is called El Castillo, a 140 foot tall structure with a number of steep stairways and impressive stucco friezes. 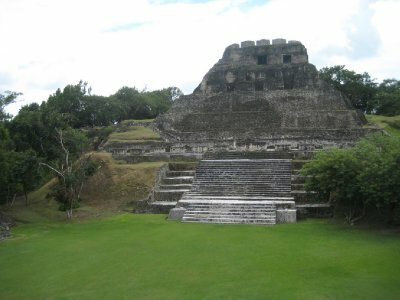 Being low season in Belize, I arrive to find I am almost alone at Xunantunich. As I walk up into the main plaza, a tour group of four (plus a guide) are just leaving. 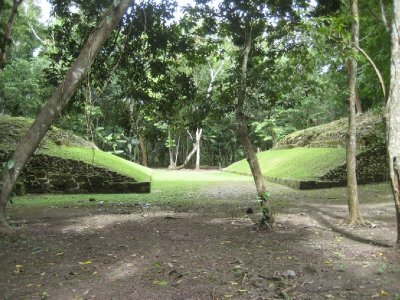 I wander towards the main pyramid - El Castillo - and meet just one other traveller, a solo woman wandering the site without a guide, like I am. 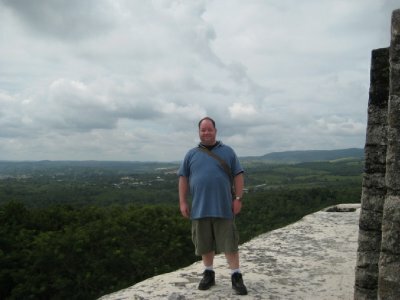 I climb to the top of El Castillo, and look out over the countryside. Off in the distance, the Belize countryside and the borders of Guatamela. Nearer to us, aerial views of the other temples. The air is thick and sticky, not a hint of wind. The only disturbance is a swarm of dragonflies flittering around in the air. I sit down atop the temple, lean against the hot stone and think about the end of days. For those who like to think about the end of days, the Mayan has most recently come to prominence due to their calendar. The Mayan Long Count calendar, one of many different calendar systems they had, consists of a number of repeating, cyclical counts, each represented as a separate symbol. The long count consists of the five ascending cycles of kins (days), winals (20-day months), tuns (360 days), k'atuns (20 tuns), and bak'tuns (20 k'atuns). 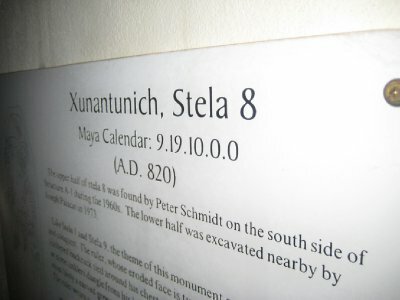 My birthday is represented as 12.17.17.3.16, and the day I visited Xunantunich (October 31st, 2010) represented as 12.19.17.14.18. (For the really pedantic, this is using the "Goodman, Martinez, Thompson" or GMT correlation). It is often been quoted that the Mayan calendar ends on December 21, 2012. This is when the all the four lower digits reach zero and the highest order digit (the bak’tun) should tick over to 13. According to Mayan tradition, we are currently living in the fourth world (the previous three having not worked out), and like the three world’s previous, ours will end at the start of the 14th bak’tun (13.0.0.0.0). Therefore, say the doomsayers, the world ends on that day. The historical evidence for this, though, isn’t clear. The ending dates of the previous three worlds aren’t definitively known, and some Mayan inscriptions do have dates beyond the 14th bak’tun, though not rendered in exactly the same way. Some scholars even think that the new world should begin on the 15th bak’tun, not the 14th. So rest easy, the world won’t end in a little over two years. 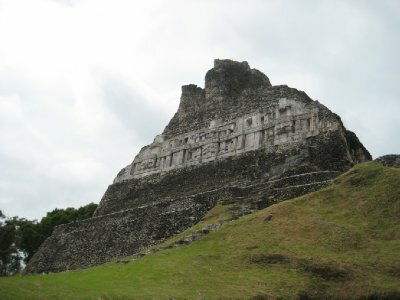 Just in case, though, I’m glad I got to see Xunantunich before then. Just in case the end of days is coming.